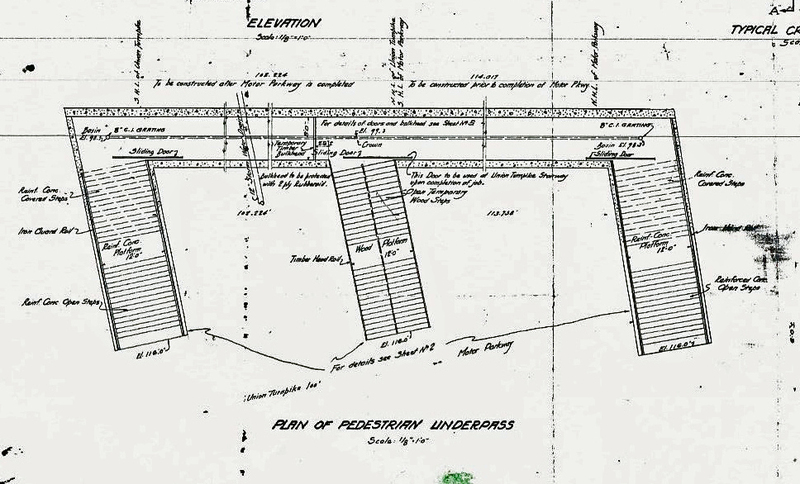 My favorite co-author Al Velocci found a 1929 blueprint showing plans for a pedestrian underpass under the Motor Parkway and Union Turnpike. 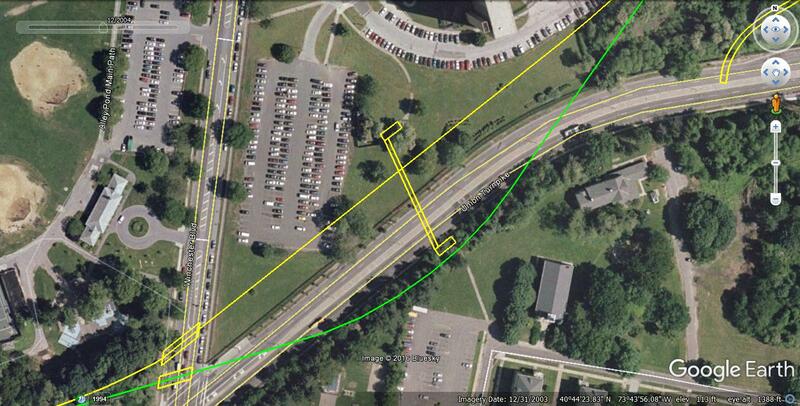 It turns out that I had two construction plans of the proposed underpass in my survey files. 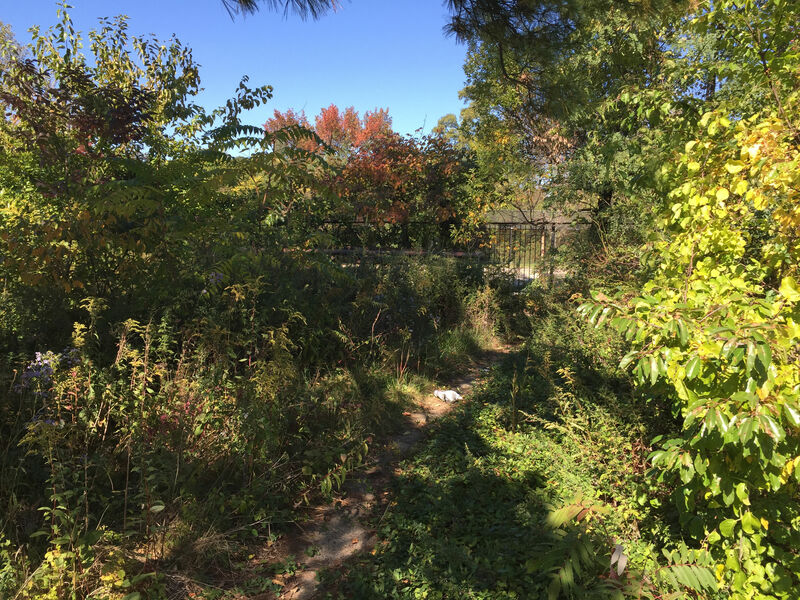 Update 10/9/2016: George Zink has confirmed that the Union Turnpike/Motor Parkway Pedestrian Underpass was built and remnants still exist. 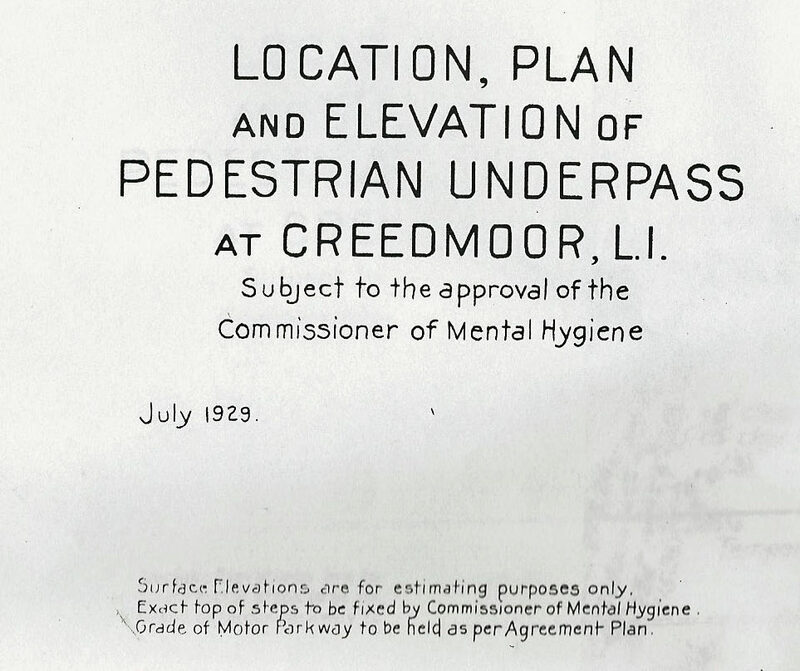 Update: 10/12/2016: Al Velocci has forwarded another blueprint of the pedestrian underpass dated July 1929. Update: 10/14/2016: Frank Femenias added a Google Earth "Now and Then". 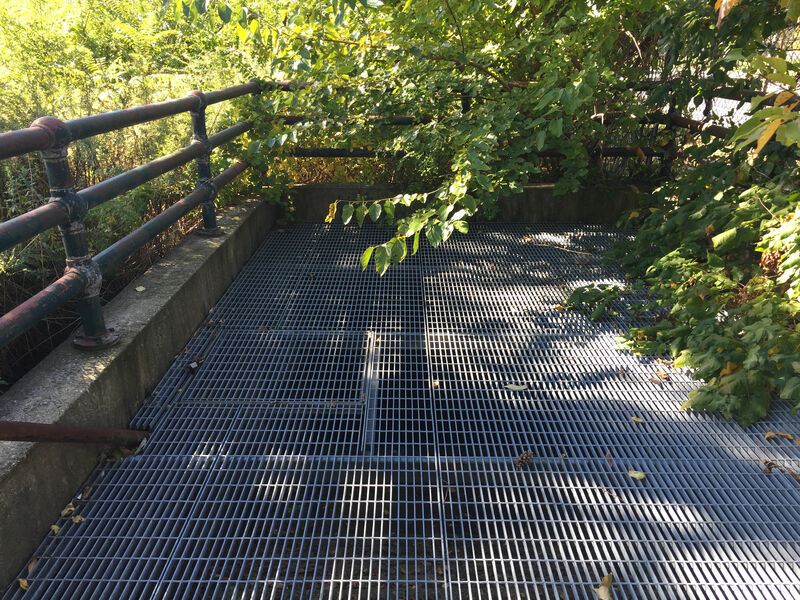 Update: 10/16/2016: Dave Russo adds more photos of the Union Turnpike/Motor Parkway Pedestrian Underpass. Update: 11/2/2016: Frank Femenias added more Google Earth aerials. 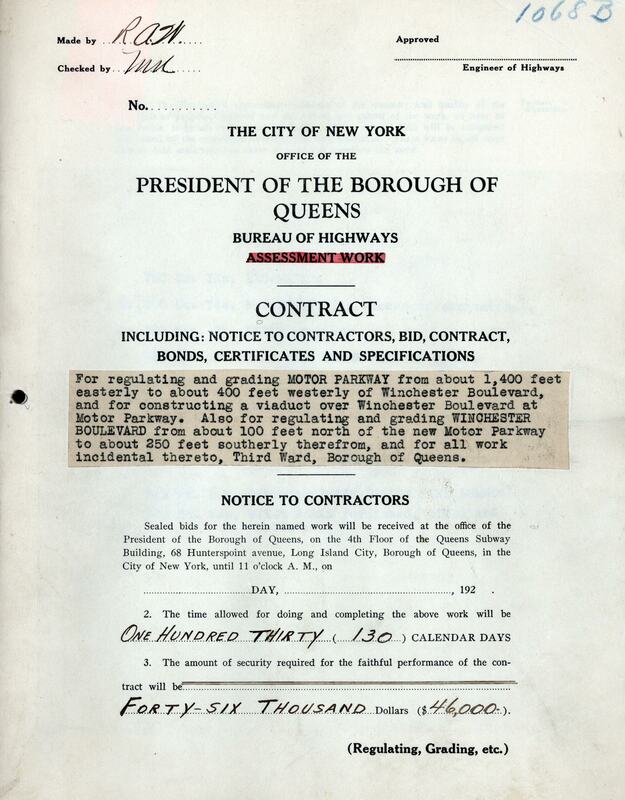 In the late 1920s, New York City decided to widen Union Turnpike to make it a major east-west road through Queens. However, the Motor Parkway in the area of Winchester Boulevard was in the path of the expansion. New York City planned on moving a section of the Motor Parkway just adjacent to the Union Turnpike and build a pedestrian underpass under both roads. The plan was dated September 3, 1929. 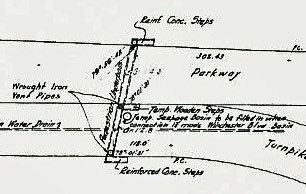 The two construction plans for the pedestrian underpass. The proposed underpass was to be built east of Winchester Bouleard under both the Motor Parkway and Union Turnpike. 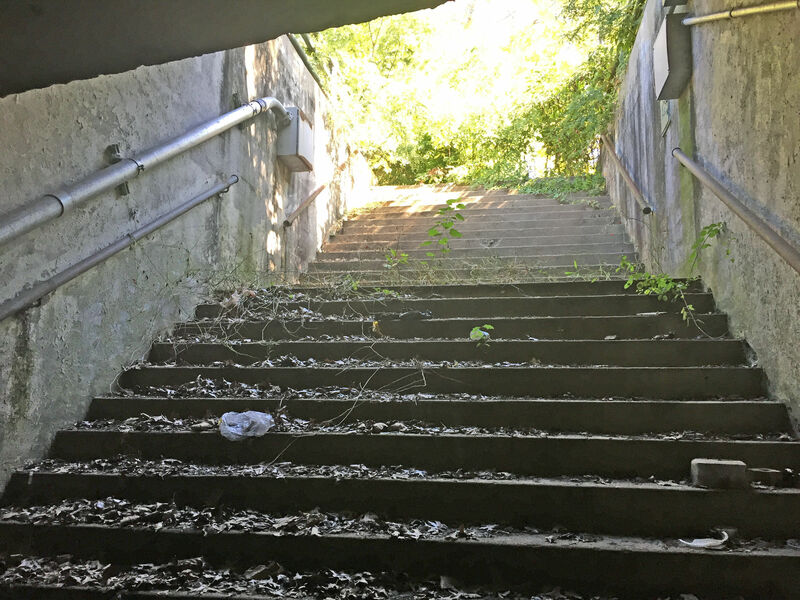 Two concrete staircases were to be built south of the Union Turnpike and north of the Motor Parkway with temporary wooden staircased in the middle of the underpass. 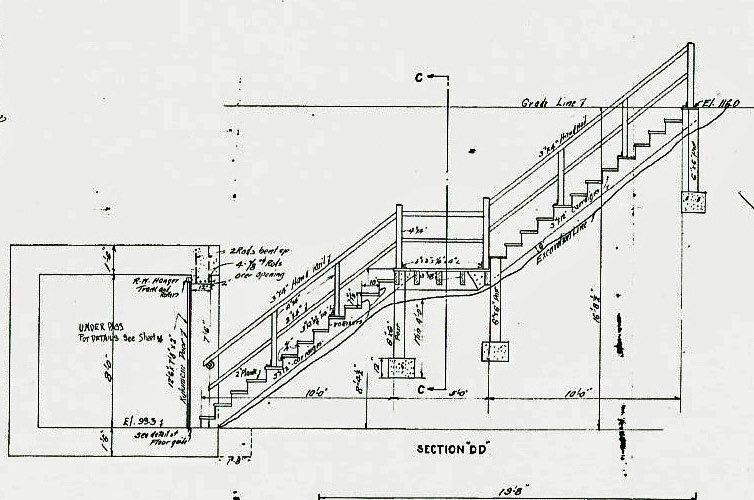 A sketch of the concrete staircase. 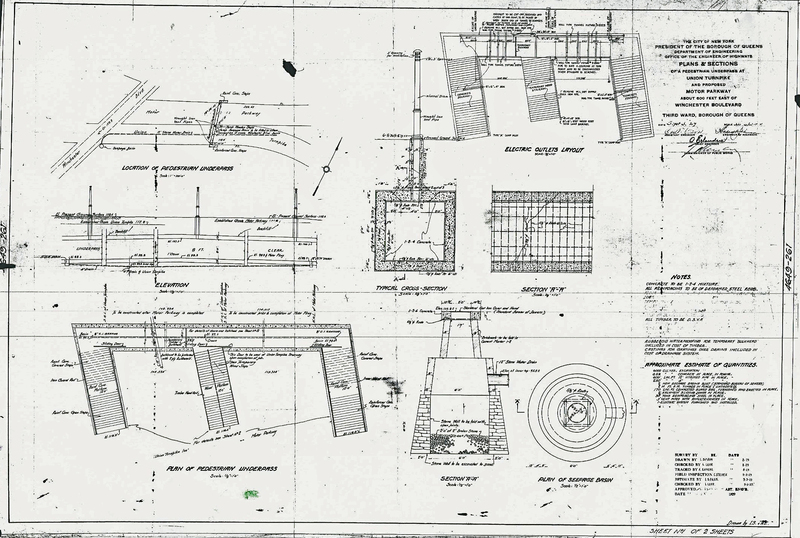 Update: Pedestrian Underpass Blueprint (July 1929)- Submitted by Al Velocci. In 1930, New York City developed a new plan to move a section of the Motor Parkway 100 feet north of the original location and build a pedestrian underpass under just the Motor Parkway . This agreement was described in a New York Times article on June 22, 1930. The project was awarded to contractor Kennedy & Smith for $46,000 (equivalent to $663,000 today). Union Turnpike on March 9, 1932 before it was widened. The two Motor Parkway bridges over Winchester Boulevard can be seen to the left in the background. 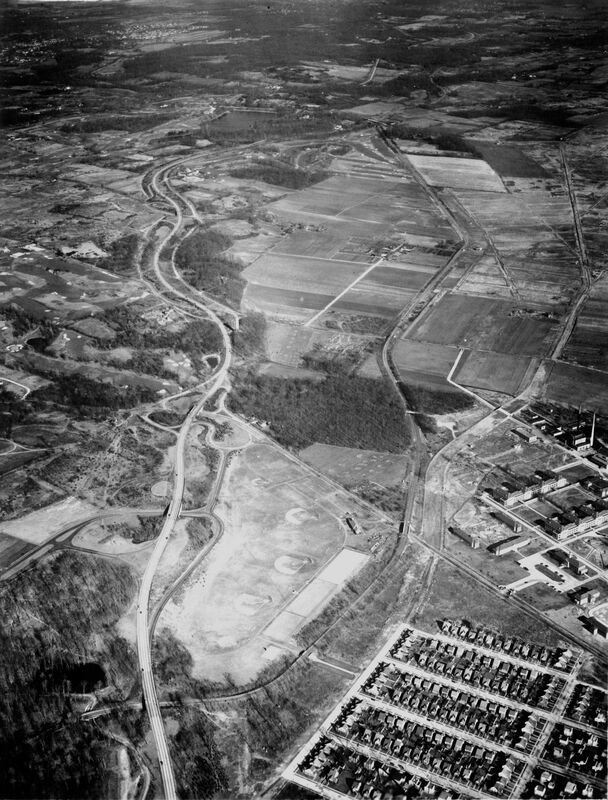 This 1932 photo shows both the old Motor Parkway and new section of the Motor Parkway east of Winchester Boulevard. 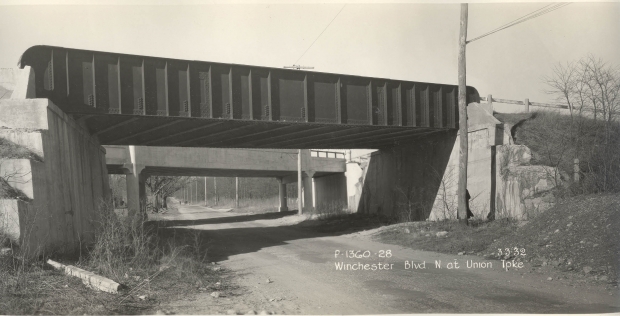 This March 3, 1932 photo shows the two Motor Parkway bridges over Winchester Boulevard, the railroad-type original built in 1912 and the new concrete bridge further north. 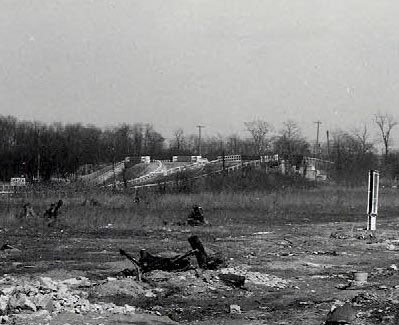 Soon after, the old section of the Motor Parkway and the original Motor Parkway bridge were taken down to make way for the expanded Union Turnpike. 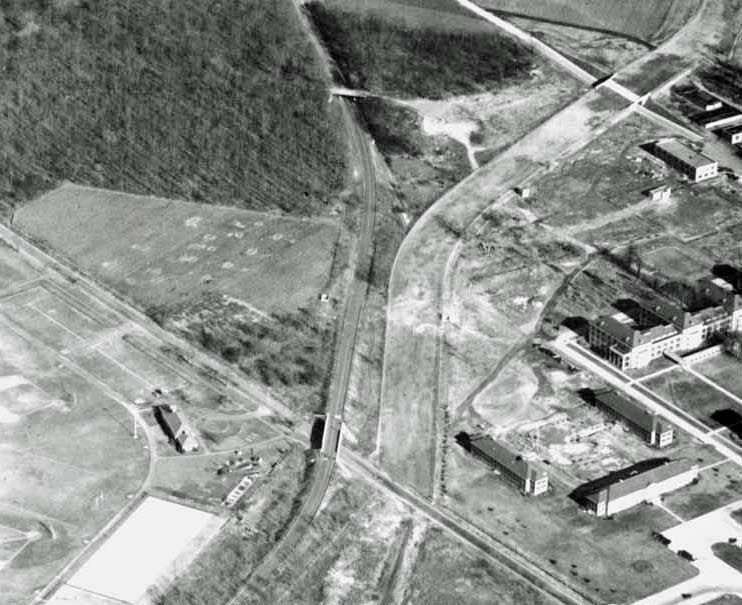 This 1937 Queens aerial of the Creedmoor Hospital area. 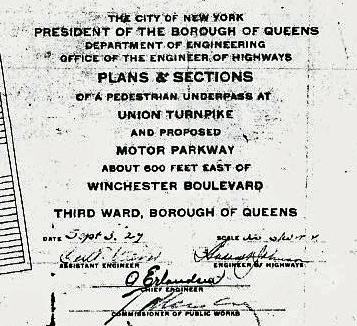 Note the outline of the wider Union Turpike built in the right-of-way of the original Motor Parkway. 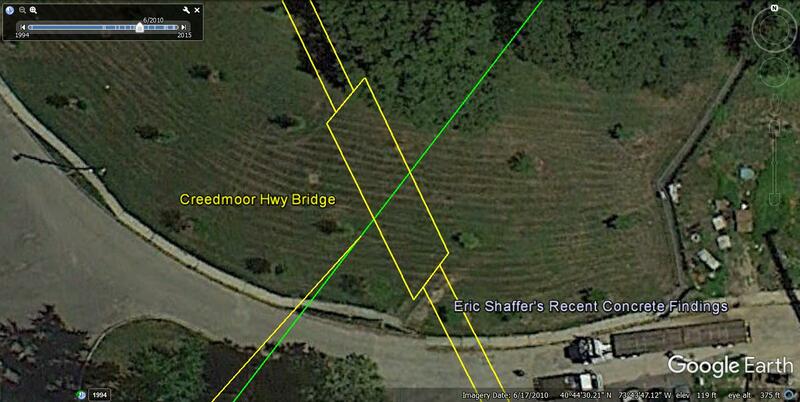 Update: After reading George Zink's comments and photos, the north and south entrances can be found in the aerial. Loaction of the old and new Winchester Boulevard Bridges, old and new sections of the Motor Parkway and the Creedmoor Motor Parkway Bridge.. 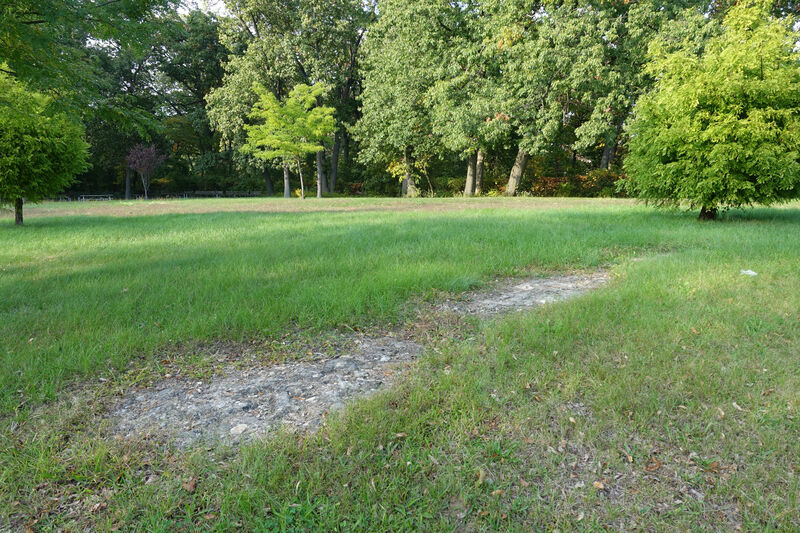 This concrete section on the Creedmoor property rediscovered by Eric Shaffer may be the remnants of the Creedmoor Motor Parkway Bridge. George Zink: The below photos were taken by me Sunday October 9, 2016 after reading about the tunnel under Union Turnpike in your newsletter. 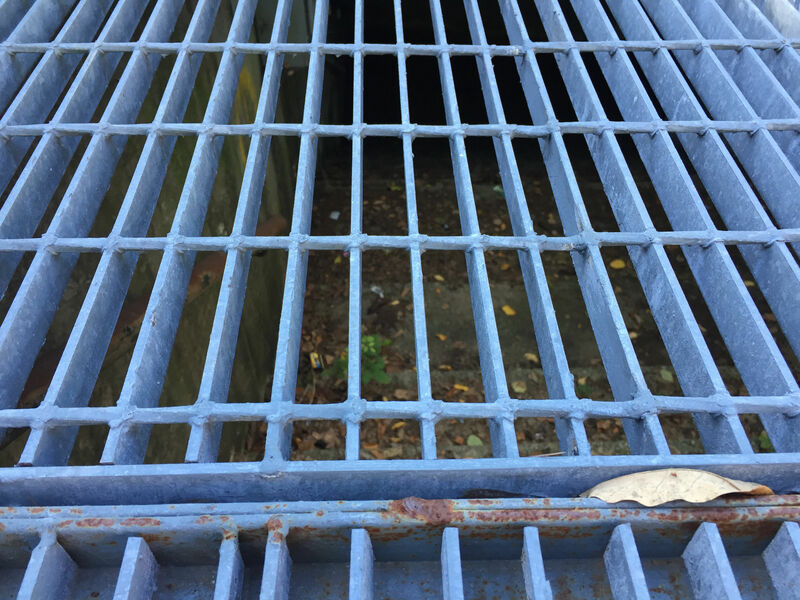 If you walk along the south side of Union Turnpike going about 800 feet east from Winchester Boulevard and looked through the fence, you will find a foot high rectangular concrete structure with an iron grating preventing entrance. 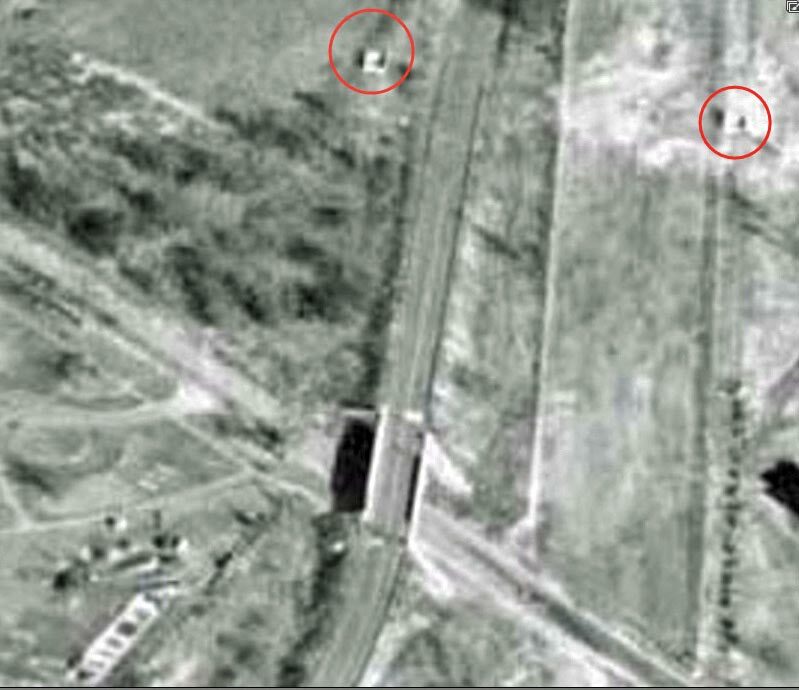 In the early 1980’s, I was looking for a running path inside Creedmoor and found this structure. There was no grating at that time and the grafitti practitioners had found it first. I did venture into the structure which turned out to be a tunnel and I exited it on the north side of Union Turnpike a short distance inside the fence on Creedmore ground. I guessed that it was made to provide a safe path between the newer large hospital building and the Creedmoor complex. Who knew? Taken through the gate at the entrance to the tunnel on the south side of Union Turnpike. According to my pedometer, it is about 300 meters from Winchester Boulevard. Stepping back to the Union Turnpike curb, this shows the gate. The gate is the remains of the old iron picket fence still surrounding much of Creedmoor. It has since been supplemented by a chain-link fence. That bent over piece of fence post has some barbed wire attached. Taking an 180 degree turn from the last shot towards the north to The big Creedmoor Hospital. After crossing Union Turnpike, the southern tunnel entrance looks like this. The northern entrance to the tunnel appears even with the white truck near the center of the photo. This photo is taken from the southern Creedmoor hospital parking lot. The tunnel entrance steps taken from the railing prominent in the above photo. The northern wall of the entrance. This looks like a lamp post at the southern wall side of the entrance. A photo of the tunnel entrance in relation to the Creedmoor Hospital. A photo back to the gate, across Union Turnpike and looking at the southern tunnel entrance. Frank Femenias: This photo facing east shows a railing structure along the southside of newly built Motor Pkwy (left side roadway), constructed for the Union Tpke expansion. 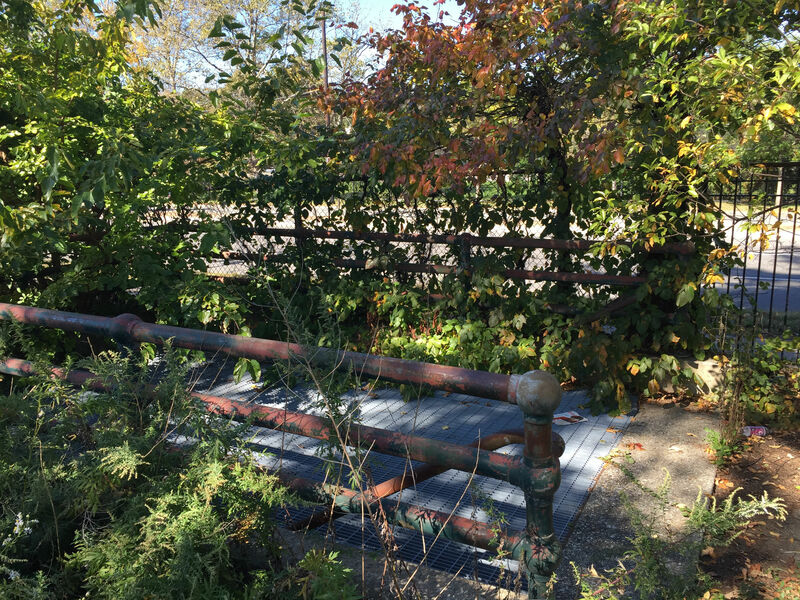 This railing measured approximately 600' from the Winchester Bridge where this photo was taken from, and where the underpass was proposed to be built. I believe the railing was the underpass but correct me if I'm wrong. 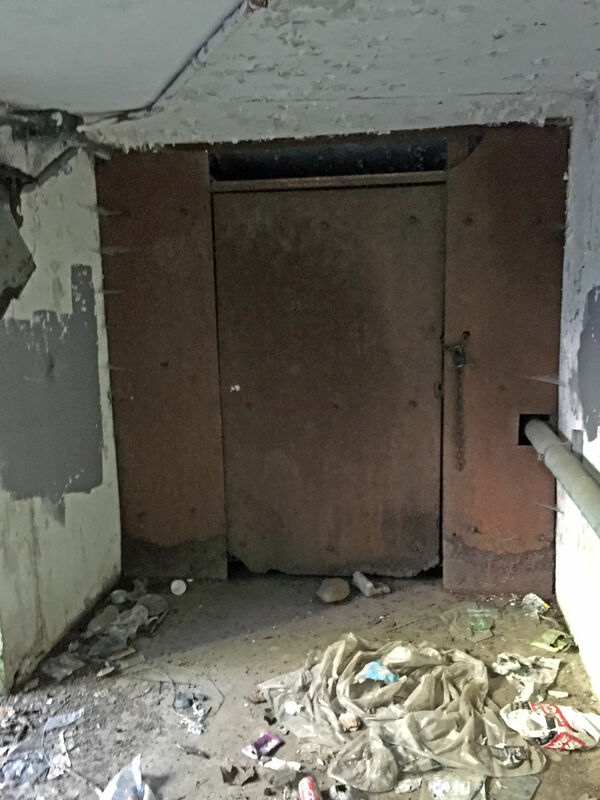 When you come to the bottom of the steps, make a left and you are confronted with this "door"
If you notice there is a small void at the top of the door that you can (with some pull-up skills) see in. It appears to be a completely clear passageway to the other side. The "tunnel" appears to be perfectly in tact. Going back up the steps. Looking back - walkway that leads up to the tunnel. The entire entry is closed. Very difficult to photograph, but you can see down there when you are there. The steps go down and then make a right (on the north side you went down and made a left). And you can see that it's the same clear concrete passageway straight through. Is it just me or does this seem to have been one of the worst ideas EVER. Dank, dark and dirty doesn’t even begin to describe the mess that would have resulted. 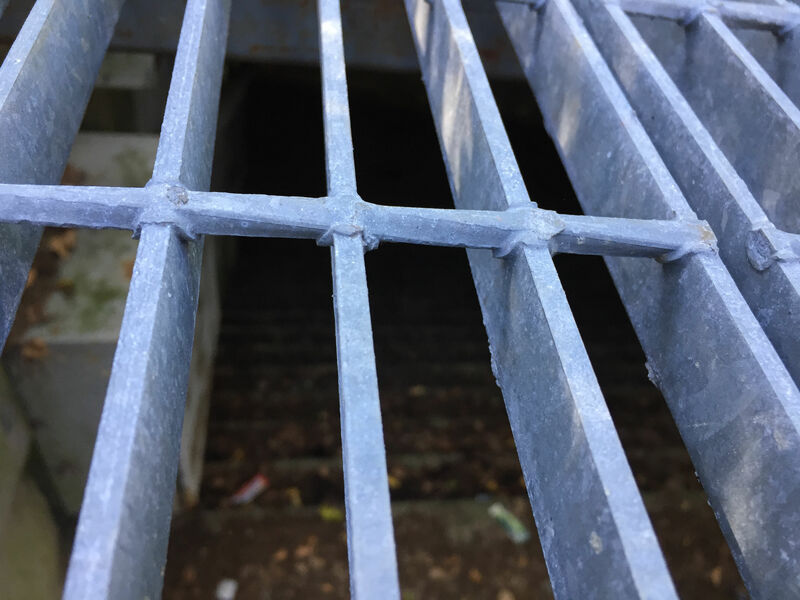 If you walked along the south side of Union Turnpike going about 800 feet east from Winchester Boulevard and looked through the fence, you would find a foot high rectangular concrete structure with an iron grating preventing entrance. In the early 1980’s I was looking for a running path inside Creedmore and found this structure open. There was no grating at that time and the grafitti practitioners had found it first. I did venture into the structure which turned out to be a tunnel and I exited it on the north side of Union Turnpike a short distance inside the fence on Creedmore ground. The northern exit may still there but hidden by trees that have since grown up around it. There was construction in the area and it is possible that exit no longer exists. I will try to take some photos when I get the chance. I guessed that it was made to provide a safe path between the newer large hospital building and the Creedmore complex. Who knew? Thanks for the very interesting newsletters. So the proposed underpass would’ve been between Winchester Blvd and the Creedmore pedestrian overpass? 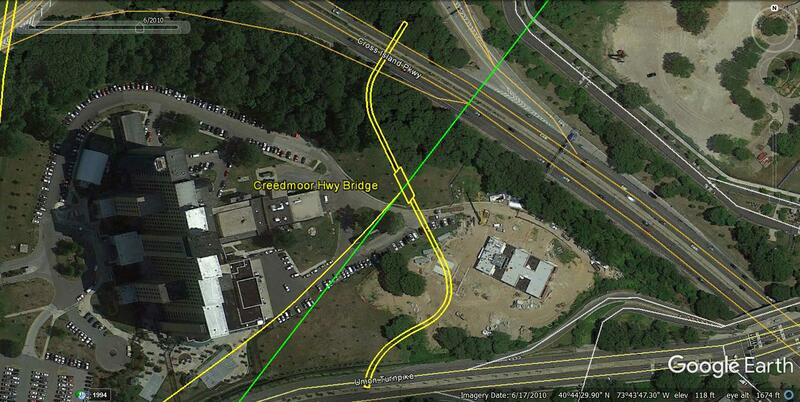 I guess the N/S of the proposed underpass would’ve led one onto the Creedmore property, too? That is correct. Al Velocci believes the Creedmoor Bridge was the original highway bridge built in 1912. Howard, about to send a photo of the ped underpass but George already nailed it. Great observation George! See above photo. Great job George, and James you’re right about conditions that would’ve existed. Now, how to enter the tunnel. I have a flashlight! A+ on your coverage of this tunnel, Mr. Zink. Your photos exhibit that this tunnel was built to last. And Howard’s aerial clearly shows the N and S entrances. My mom was an aide with the Central Islip Psychiatric Center until it closed. She then worked for Creedmoor for a few years until retirement. I’ll have to ask her what she may know about this underpass. I wouldn’t venture in there without a buddy or protection. I guess you’re right about that Frank. A lot of findings and still more,it never ends does it? Keep on looking guys.Doing great so far,as usual. Awesome post! I’ve passed this but just assumed it was Hospital related - some sort of former walkway. Love this stuff. Will have to check it out. Did you go down the steps and take pics inside? What’s in there???? 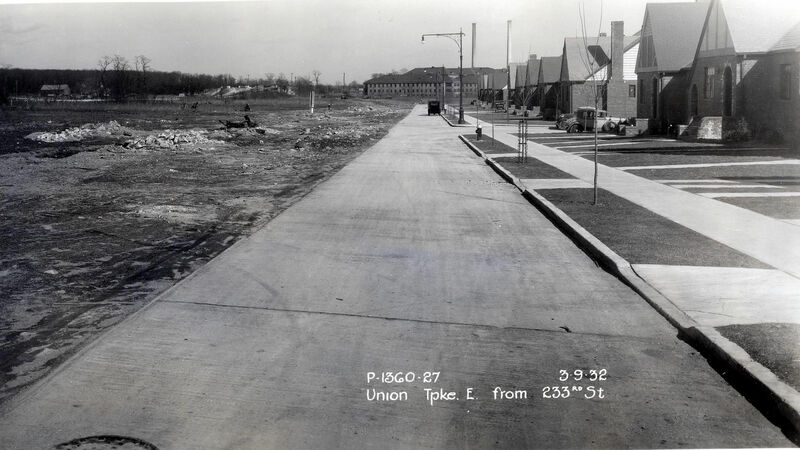 Taking another look at the photo with both LIMP roadways, the white railings are set in Union Tpke’s ROW yet to come. Underpass entrance here is incorrect. The railings appear to be at the underpass’ midpoint, where there should be street above. Perhaps a temporary underpass entrance for construction purposes. I know ZIP about burrowing tunnels, especially one of this length. That fenced off area you point out, Frank; made me curious too. It would seem that this was a midpoint area in building of the tunnel. I’m thinking this because Union Tpke eventually was expanded over the original section of LIMP, and the end result aerial shows tunnel access S/O Union Tpke, and N/O the new LIMP section. Brian, you’re right on! 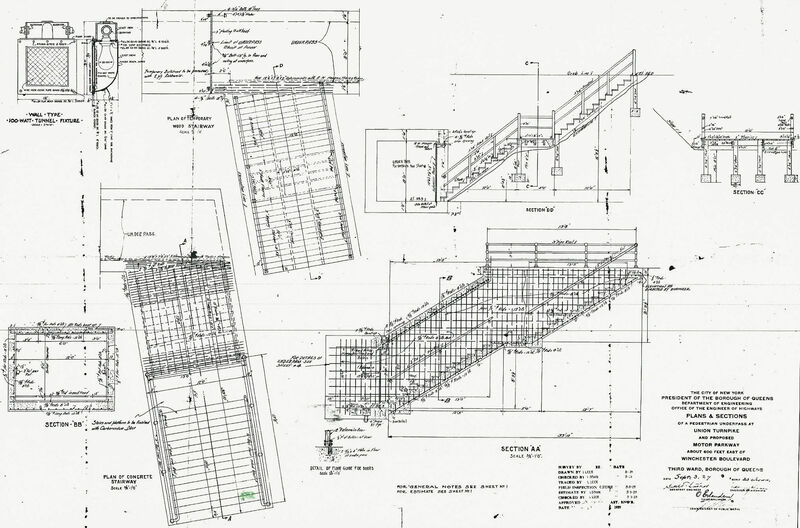 Looking deeper at the Construction Details diagram above (the first schematic), the white railing in the photo is the temporary wooden staircase that was built at midpoint during construction. 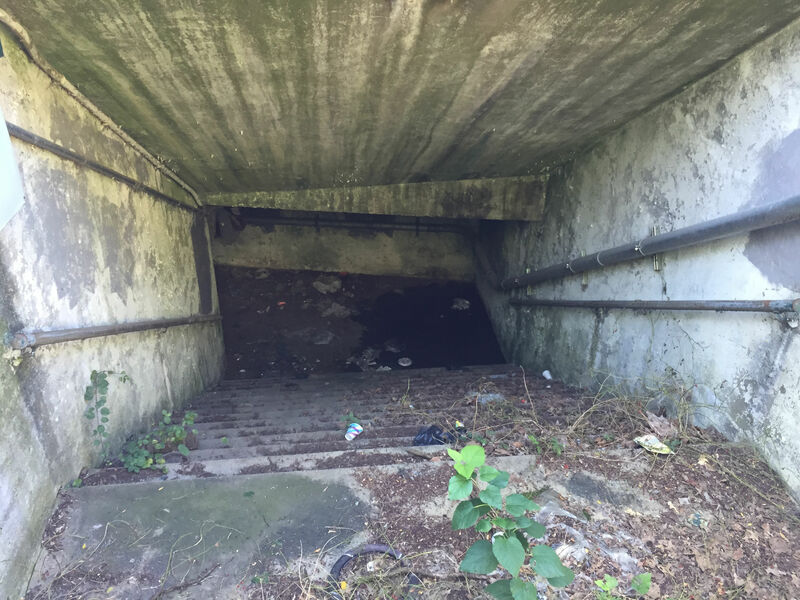 Looking further at the schematic, inside the tunnel there is a sliding door at midpoint leading to this staircase up to Union Tpke, which now raises another question. 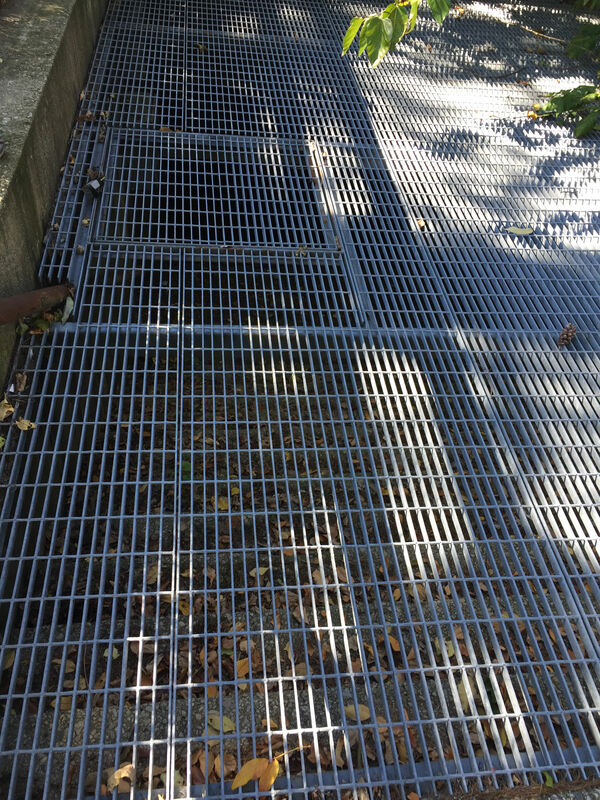 Is there a second metal grating on Union Tpke’s north sidewalk leading to this staircase? And what condition is the wood after 84 years in the underground closet? Need to pay a visit there soon. Nice work everyone. I need to check it out personally. Great seeing others share the exploring bug! We all know the LIMP was just N/O Union Tpke at the tunnel location. 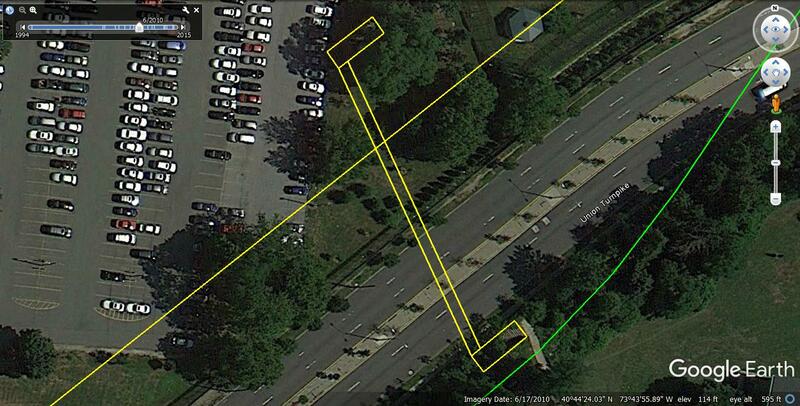 But the tunnel access just N/O the LIMP ROW provides a good refrence point to possibly find any LIMP pavement, etc. I’ll just say the obvious. 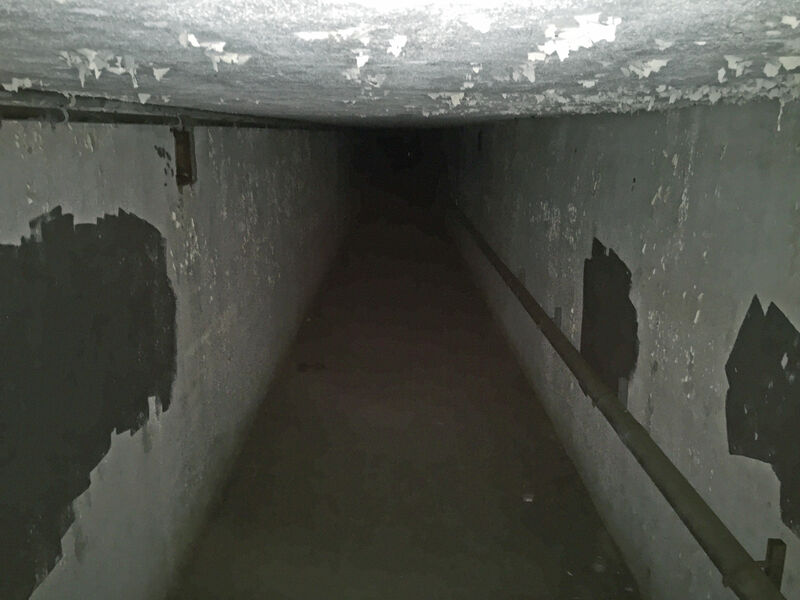 This tunnel was utilized by hospital employees, patients. The Creedmoor Highway bridge that was just to the east served a similar purpose. But capable of supporting vehicles, etc. Also if hospital employees/patients had access to this path recently, access may not be as difficult as I predicted earlier. I was expecting a Bolt Down gate. There is hope here. You went to town,and then some;Dave Russo! I’m sure you would’ve went into the tunnel if possible. There must be some airflow thru the tunnel, air quality should’nt be an issue. This post definitely got the explorer bulb burning. I had to go this weekend and check it out! Great find. And if there were any remaining “unknown” or “mystery” element regarding the inside of this tunnel I would definitely have gotten in there but I see what it is, it’s a great find but the pic you see over the door looking in….that is exactly what is on the other side so it’s just a straight / narrow / concrete run from one side to the other. It’s great that we have this venue to share our discoveries and fuel the exploration passions. Great stuff Dave Russo and George Zink for exposing this gem. There was no access point for the midway wooden staircase on Union Tpke’s north sidewalk. I checked. 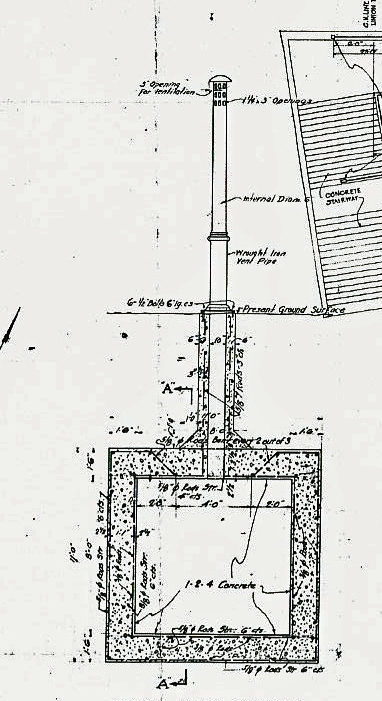 Most likely it was sealed off soon after construction, as stated in the construction diagram. Its entry sliding door along with two others must still exist within the underpass. Have a ball tomorrow and next week! Hi Sam III, the underpass on north side is right on, but south side should be located slightly more towards the west. I had to use different satellite image dates to locate each staircase. GPS tracks were also recorded on the site and matched up with both satellite images (see above) - sending Howard some pics. Both staircases are two tier and run straight towards the west. The underpass is located on the west side of both landings. Hope to see you all on Sat for this fantastic tour. Amazing stuff guys! Comment #25, lol. Frank and I will be there and square for the tour, etc. Look forward to finally meet all in person. Is the Creedmoor facility actually allowing access thru the tunnel? And I speak for Frank as well, definitely want to take a good look around the Creedmoor property for LIMP remnants. The more eyes, the better. Explored the whole area on both sides of Union yesterday, Nov 19, with my brother Dennis and son Gram. Must note yet again that the thought of such an underpass seems nearly mad in a Gotham-ish and Arkham sort of way. Easier engineered pedestrian overpasses would have been far simpler and sightly. My brother tells my our dad talked often of this underpass as being a facilitator for patient movement but I’m still unconvinced it would have been a safe and sane activity. The Union roadway overpass just east of the location was a constant source of wonder for me and my fellow day hikers in the late 50s and early 60s where we would throw down a ball in order to engage both Creedmore workers and patients in friendly conversation. None of it was mean spirited in any way. We just wanted to know more about the giant hospital we grew up in the shadows of.